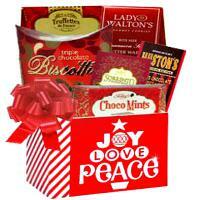 Send Christmas Baskets You Would Love to Receive Yourself! Hello, It's Holiday Time, and we're all kids at heart! In keeping with the holiday spirit, we've devoted this section of our catalog to the unveiling of our gorgeous holiday gift baskets and dazzling Christmas gifts for delivery. It is more than possible to find great holiday gift baskets for clients when you choose to look at a website that clearly has something to offer everyone. Variety is the spice of life. That is what you get when you purchase Christmas corporate gift baskets. Each selection contains an assortment of items, making it highly likely that your gift recipient will appreciate your gesture from the moment it is received until the last item has been removed and enjoyed. One of the most appropriate times of the year to express your gratitude is during the holiday season. Many individuals are exchanging gifts at this time of the year, so your gift will not look out of place. You can recognize the hard work that someone has put in or the exceptional value that your relationship with a business client has for you. As the holiday season approaches, the need to come up with Christmas gift basket ideas for your customers becomes increasingly more important. Fortunately, most of the difficult work is done for you since a wide variety of themed corporate executive gift baskets have already been assembled. Some of the top choices include elegant wines, champagne and caviar combos, decadent chocolate gifts, elegant coffee ensembles, and gourmet food baskets. Of course, a diverse selection of new business holiday gift baskets is available, including those that contain cheeses, jellies, cookies, and monogrammed gift items. Your business relationship can improve when you take the time to select an appropriate gift for business clients. Christmas gift ideas should convey the message that you want to get across to your customers, partners, and company employees. 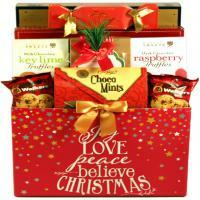 The bigger the message, the more elegant or expensive your choice in Christmas corporate gift baskets should be. Long-lasting bonds over the lavishness of this type of presentation. What criteria should you use when making your selection? 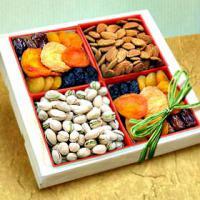 Ideally, you should have some familiarity with your gift recipient so that you can choose wisely. You should factor health conditions into your equation along with family circumstances. The importance or longevity of the business relationship should also be taken into consideration when you are deciding which corporate holiday gift ideas are the best ones. Each holiday season, you are faced with the same type of decision. What should you give to your top personnel to show your appreciation for all of their hard work? 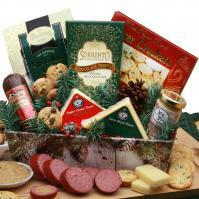 Coming up with Christmas gift basket ideas for your staff is much simpler today than it has been in the past. 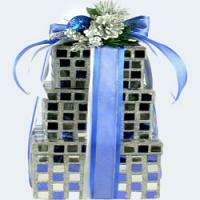 The availability of themed collections makes it easy to come up with Christmas party gift ideas for the workplace. You may want to consider purchasing company Christmas gift baskets that are similar in size and value to avoid conflict in the workplace while promoting a sense of togetherness and appreciation. While the gesture itself might seem simple, the message that it sends is usually more complicated. It is important to consider your selection of business holiday gift baskets carefully to avoid offending someone when your intention is to show your appreciation, recognize, congratulate, or thank someone.